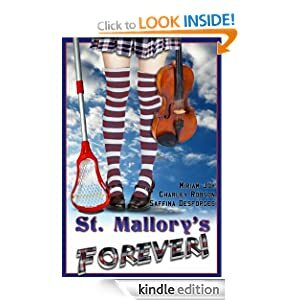 collaborative fiction – St Mallory's Forever! How did four writers from different places in the world – Grimsby, London, Dorset and West Africa – and of different ages end up collaborating on a YA novel set in a boarding school? It’s a good question. I’m now going to attempt to summarise the journey from my point of view. Just a few weeks later, Spook – who now goes by her given name of Charley – sent me a Facebook message saying that Mark wanted the two of us to collaborate with ‘Saffina Desforges’ to write this novel, and would I like to? I wasn’t sure. I’d not read or written any mysteries, I knew nothing about boarding schools, and an aversion to plotting, outlines and coherent sentences has always made serious collaboration tricky (though I’ve done some fun collaborative Doctor Who fan-fics). I wasn’t about to let Charley get all the glory of publication without me, though, and I’m always up for a challenge, so I said yes. This was some time in July or August, I think, and we initially planned to release it in time for Christmas, which was a little optimistic. After a few enthusiastic weeks (I also take the credit for writing the first chapter, which then got chopped up by the other two, mashed around, and some of it stayed in and some turned up later and some disappeared into the ether), it fizzled out, and between late October and mid January there was no activity on St Mall’s at all. And then my grandma died. I needed to distract myself, to occupy my brain, and I didn’t feel like writing my own novel – it’s always had a strong autobiographical content. I dug out the draft, read the whole thing through, and ended up adding a few thousand words to the end of it. That was enough to get the ball rolling again: since then, a week hasn’t gone by without one of us adding to it, and sometimes two of us will write five chapters over just a couple of days, much refreshed after our long break! It’ll be a little while until it’s finished. Meanwhile, cover designs are going ahead, and we’re planning promos and videos. I’m writing chapters, sending them to Charley, and having them back in my inbox the next morning with more added, a speed at which we never worked before. It’ll be good to have you, who will perhaps be our future readers, on this journey with us. Five months or more may already have gone, but there’s still a long way to go. With your support, St Mallory’s Forever will never again languish on an email server for three months. We’ll get it finished, and you’ll be there every step of the way. Does that sound like an idea? Then now would be the time to put your email address into that gorgeous little box on the right. I’ll see you next time!